Citizengame.co.uk, although it has a UK web address, is a newly launched Irish games podcast. Thursday night’s ‘Cork Talks Back’ on RedFM, a Gears of War special, will include an interviewer with the game’s lead designer. Epic Games’s Cliff Bleszinski (or Cliff B) will feature in an interview on the show hosted by Victor Barry. The show will also be giving away copies of the game. Cork Talks Back broadcasts at 9pm from 104-106FM in Cork and online vie www.redfm.ie. After the show goes out the interview will be available for download on the station’s website. The European “Emergence Day” – Epic’s and Microsoft’s marketing name given to the release date of the game – is Friday. The game is one of Microsoft’s triple-A titles on the Christmas line up. Victor Barry will be playing over Xbox Live in a public session on Saturday between 3pm and 5pm. Barry (gamertag: vicbarry) will follow in the footsteps celebrities worldwide, and Today FM DJ Ray Foley (gamertag: Ray Foley). Barry has also been blogging about Gears of War – here, here, here, and here. Pictured above are RTE 2FM DJs Cormac Battle and Jenny Huston, left and right, with a model, center. The photocall yesterday was to launch SingStar Rocks – earlier this week we published details of Sony’s partnership with the national broadcaster to promote SingStar Rocks. Sony teams up with RTE for SingStar Rocks! - Set list for SingStar Rocks! Sony’s SingStar karaoke game for PlayStation 2 is to branch away from its pop beginnings with ‘SingStar Rocks!’. The company is linking with RTE 2FM to see the game promoted for two weeks on the Dave Fanning show from this week. SingStar Rocks and previous SingStar releases come with and without two microphones that connect a USB port on the front of the PlayStation 2. 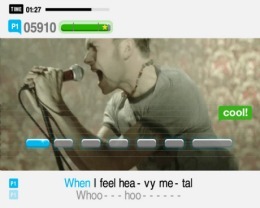 The karaoke game includes music videos, and an on-screen display compares singers’ pitch, tone, and rhythm. A competition will run on Fanning’s show with the overall winner winning “the ultimate live music experience” of European Rock festivals, which includes the ‘Roskilde Festival’ in Denmark, and ‘Rock AM Ring’ in Germany. Included in the partnership is the 2FM Roadcaster broadcasting from SingStar Rocks events in retail outlets, 2FM DJ’s Cormac Battle and Jenny Huston appearing in the game’s intro, and a Top 100 Rock Tracks weekend on the radio station. The relationship “offers RTÉ 2fm a new and exciting way of connecting with our target audience” said 2FM boss, John Clarke, “SingStar Rocks in association with RTÉ 2fm is full of songs our listeners constantly request & now they can have fun singing their favourite tracks in their own homes and having their performance rated by the SingStar technology”. The release follows ‘SingStar’ (early 2004), ‘SingStar Party’ (before Christmas 2004), ‘SingStar Pop’ (spring 2005), and ‘SingStar ‘80s’ (Christmas 2005). The game originates for Sony’s ‘London Studio’, and overall has sold has 3.6 million copies as of the end of last year. At the start of the year, Sony Computer Entertainment Ireland also ran a music competition with Dublin radio station Spin 1038. The winners 'Exit 15', had their track, ‘Come Shot’, added to a website as a download for the PlayStation Portable game WipeOut Pure. The competition ended at a live final at the Village, Wexford St, in Dublin, judged by DJs David Holmes and Johnny Moy. The PSP launched here on September 1, 2005, it has sold over 115,000 units in Ireland. Last month Sony launched the PlayStation Schools Cup, a European five a side football league that includes 32 schools across the island of Ireland. With regional heats in Belfast, Cork, Dublin, and Galway, the winners will get an all expenses paid trip to the Champions League Final in Paris on the 16th of May, and a the chance to play in the European PlayStation Schools finals in Paris. According to a thread on the forums of gamecon.ie, the local Dublin radio station 98FM now features game reviews on Justin McKenna’s entertainment show, Saturday mornings between 9am and 10am. The reviews are by Jermain Williams, a organiser of the multiplayer event GameCon, and Interactive Creative Director at the marketing company 'Dialogue', whose client list includes Microsoft, and their Xbox division. Williams has worked with both 98FM, and Xbox, accounts.